Here you will find the today’s top trucking news. We add new content daily, so check back often to stay up to date on all things trucking-related! A Love's truck stop worker has been credited with saving the life of a truck driver who collapsed while choking on a bite of a hamburger. Authorities in California have confirmed that a semi truck exploded at the Port of Los Angeles on Monday. Workers at a heavy duty truck dealership were treated to a visit from President Trump on Monday as he delivered a message about taxes. A Michigan judge sentenced a former trucking company worker to life in prison without parole for the shooting deaths of two ex-coworkers. California police say that an illegal 'sideshow' ended with a city bus and a semi truck looted and set on fire on Sunday. A Minnesota woman's video of police giving a snow- stuck trucker a much-needed nudge has gone viral. A new Love's Travel Stops location has opened in Northern California, bringing with it more than 100 new truck parking spots. 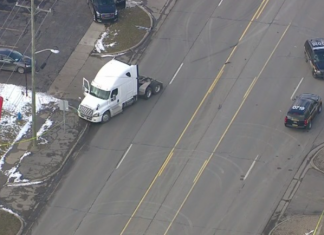 A group of truckers who are protesting regulations in the trucking industry are 'slow rolling' in Chicago in spite of the fact that they've been issued a stern warning by state police. A storm chaser in Texas captured dramatic footage of a semi truck that succumbed to high wind gusts. A semi truck driver died this week as a result of injuries sustained in a crash caused by a woman who stopped her car in the roadway to allow a turtle to cross the road. A couple is asking the trucking community for help in locating their stolen semi truck. Lawmakers in Ohio have passed legislation that will substantially increase the diesel fuel tax.